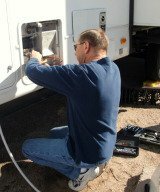 Which is better, gas or diesel engine for hauling an RV? We have a 26' trailer which seems to be inadequate and not sure our 2013 Chev 1500 Silverado LT 4x4 ext cab with 4.8 L engine is adequate for a 30'+ 5th wheel. Your current truck might be able to tow the weight for a short time but you will be better off with a diesel in every way (fuel usage under load, longevity). Diesels are made to work, just think about something, what is in big rigs? heavy equipment? and trains?.....diesel engines. I am looking for a diesel truck to pull a 5th wheel with approx. 11,500 lbs gross wt and 31 ft long. I would like a late model, 2009 or 2010, crew cab, short box. GMC w/6.6L; Ford w/6.4L, or Dodge w/6.7L?? We are diesel engine "newbies". We keep hearing a clicking noise coming from under the front of our diesel pusher after turning off the engine. You can't hear it inside the coach, only when you walk outside and it quits after a few minutes. Is this normal? We are preparing to become fulltimers, and are in the process of deciding what is best for us. One thing has me a bit curious. What are the advantages of a Diesel Pusher over a Front Engine Diesel of similar capacity.